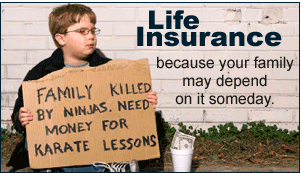 I have written about life insurance before. In general, I'm not crazy about it, but for some folks it makes sense. I go to a lot of lunches and seminars were different products are presented, and while some are only good for the broker, lots of them offer some really compelling benefits. But I digress. Where life insurance affects most of my clients is when someone did/did not make a beneficiary designation, or change one after their family situation changes. Harry Husband and Wendy Wife have two (2) children. Wendy is Harry's beneficiary on their life insurance policy he has through work, and under his will. Their life is great. Until Harry finds out one of "his" children is actually Pete Postman's. Sadly, they get a divorce. Harry later remarries to Sally SecondWife, and passes away after a lovely retirement spent watching Hill Country sunsets, having never thought about or updating his estate planning. It depends, but probably a lawsuit. If the life insurance policy was a private company administered policy, under Texas law (and lots of other places) the Texas Family code will treat your ex-spouse as pre-deceasing you, so it would go to your backup beneficiary or just into your estate. Same rules apply for your will, and financial accounts that are not dependent upon ERISA. Erisa says your beneficiary designation holds up, so if you have a 401k or similar retirement, you better change it. Also, there are a variety of policies that are governed by Federal law (namely, FEGLIA) that have strict rules, and require an update of your beneficiary instead of automatically updating it for you. Ok, well that's not really fair, is it? How can my no-good ex-wife get something she isn't entitled to? Your will is only part of the picture. For most, the bulk of your assets are going to be in the form of an IRA, 401k, bank account, insurance or other. You probably filled out a beneficiary designation when you set up the account. You likely forgot about it since then. If you have experienced a change in marital status or family composition, you have a task to check and update all your various accounts, or run the risk of your estate ending up where you did not intend it to be.